Yeah right HERE – $730, which is what the bid is at currently (as of 9.45pm), about €556, and there’s been 35 bids so far and five days to go. Ridiculous eBay auctions for records aren’t rare, but this was something I stumbled across earlier today and was quite taken aback by it. Record collecting can bring out the audacity of some sellers, but of course the bigger fools are those that actually buy the stuff. As the saying goes, if someone’s willing to buy it, someone’s willing to charge for it. 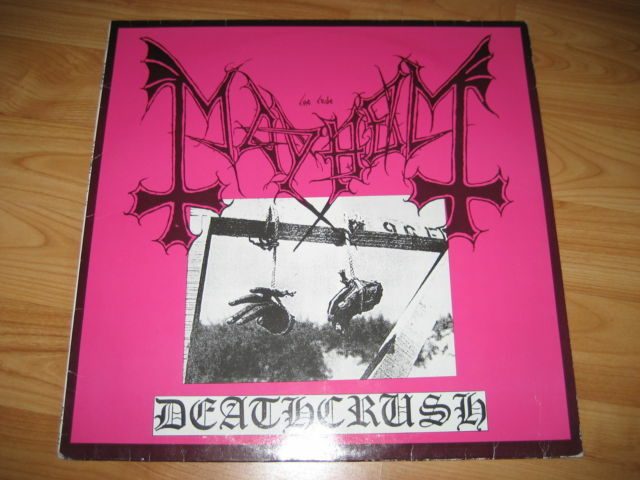 This is the first pressing of Mayhem’s 1987 EP, Deathcrush, a rather monumental release for black metal. This pressing was handled by the label Posercorpse, and has an original run of 1,000. Obviously, it’s used with the cover showing “some wear”. I’ve hunted down a few ‘rare’ or out of print records but I could never really see the point in shelling out this much money for a record, nor have I understood how some (very few obviously) won’t settle for anything other than a first pressing. Of course, different strokes for diffent folk, I guess. But this Mayhem auction has me wondering is it really worth that much money? Perhaps I don’t know enough about pricing and valuing records, but it strikes me as far too much. Granted, Deathcrush is a benchmark. If I had somehow been in Norway in 1987 and picked up a copy, I would definitely hold onto it for sentimental value, but paying nearly $600 for a second hand copy? But back to the question, is this record worth that much? Weigh in below and correct me if I’m wrong. Check out the auction HERE. I have a copy of this original pressing which I got from Shades heavy rock & metal specialist shop in London when it first came out. I would not part with it because it has too much sentimental/historic value to me personally; I used to correspond with Dead and Euronymous while doing my own thrash fanzine between 1988 and 1991. Going by auctions I've seen I'd say it would have an average value of around $300 US/£200 sterling/250 Euros. But personally I wouldn't shell-out that kind of money for any record either. As nice as it is to have rarities and original pressings there are more important things to spend your money on. Looking on Popsike there are 23 instances of this record going for more than $700, 2 of it fetching more than $2000, so it's not that high a price he's got it up there for. I don't understand why though. In underground metal terms 1000 isn't THAT rare. A lot of wanabee Satanists with too much cash I suppose.